Hugh Jackman attended the "X-Men: Days Of Future Past" world premiere at Jacob Javits Center on 10 May 2014 in New York City. Hugh Jackman wore a classic black suit over a white shirt, and accessorised with a stunning timepiece from Montblanc: the Meisterstück Heritage Perpetual Calendar. Hugh Jackman was also spotted with a plaster around his nose. The Australian actor was recently treated for Basal Cell Carcinoma (BCC). BCC is a treatable and common form of skin cancer marked by lesions or growths on the outermost layer of the skin. This cancer generally doesn't spread beyond the tumor site if treated promptly. BCC growths often look like open sores, red patches, pink growths, shiny bumps, or scars, and are usually caused by a combination of cumulative UV exposure and intense, occasional UV exposure. Rather than shying away from the topic and opting for cosmetic cover up for the all important world premiere, Hugh Jackman stood proud. He urged everyone to stay protected under the sun, and check out any suspicious signs / growths. Wishing Hugh Jackman a speedy recovery, and no more cancer from now on! The bandage on Hugh Jackman's face is not going to distract me from the gorgeous Montblanc Meisterstück Heritage Perpetual Calendar timepiece. 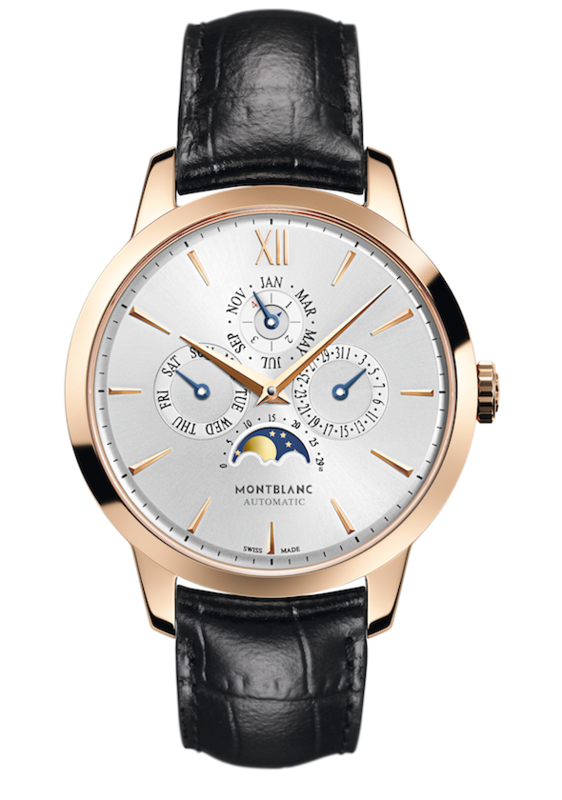 The watch featured an 18k gold case against black alligator leather straps, which suited him perfectly. High on my wishlist, the watch would accentuate any outfit, from casual to formal. The beautiful timepiece really lifted Hugh's otherwise simple outfit. The Montblanc Meisterstück Heritage Collection is inspired by the ninety-year heritage of the Meisterstück (German word for “masterpiece”). The timepiece that Hugh Jackman wore features a perpetual calendar, which always shows the correct date and requires no manual adjustment. Not even at the end of a month with fewer than 31 days and also not at the end of February in a leap year. If the mainspring of the Montblanc Meisterstück Heritage Perpetual Calendar is kept sufficiently wound, this timepiece’s calendar will require no manual adjustments until the year 2100. If this watch is left unworn for a longer period of time, its calendar displays can be quickly and easily returned to synchrony with the current date by pressing the inset buttons in the middle piece of the case. The Meisterstück Heritage Perpetual Calendar will be launched in the summer of 2014. I recently had the chance to see the breathtaking timepiece up close at the Montblanc boutique at Old Bond Street in London. Watch complications aside, I love the perfect symmetry on the watch face. A classic beauty that will certainly withstand the test of time. The above is the stainless steel model, which will retail for around EUR10,000. The 18k gold version as seen on Hugh Jackman will retail for around EUR16,900. Go check it out at a Montblanc boutique near you.